Bright Beginnings provides services that promote the health and development of infants and toddlers so that children start school healthy and ready to learn. 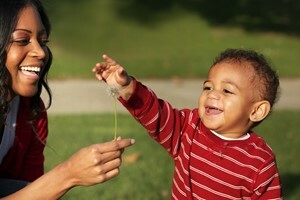 Services are designed with the family’s priorities and goals in mind and occur in the home or other community setting. Bright Beginnings supports families through the Parents as Teachers program and Early Intervention services in Cuyahoga County, and provides connections to the Help Me Grow system of supports and community resources throughout Ohio. WHY WORK WITH A CHILD THAT IS SO YOUNG? Before your little one even goes to school, the most critical time for learning happens. 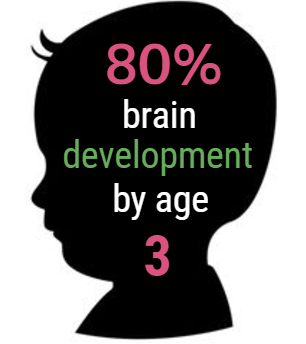 Eighty percent of a child’s brain is developed by the time they are three years old. So what you do with your baby from birth to three matters most to his or her ability to learn in school. CHILDREN ARE READY AND EAGER TO LEARN! Our children are our future and Bright Beginnings is here to support families in helping their children grow, learn, and develop to their fullest potential! Learn more about our Parents as Teachers program, Early Intervention services, and Help Me Grow Central Intake, and then Sign Up For Services. 1 Adams, R. C. & Tapia, C. (2013). Early Intervention, IDEA Part C Services, and the Medical Home: Collaboration for Best Practice and Best Outcomes. Pediatrics, 132(4), e1076. Retrieved from http://pediatrics.aappublications.org/content/132/4/e1073.full.pdf. "My daughter had an expressive language delay. Early Intervention staff came to our house and helped me learn the skills to encourage her to try new words and sounds. We had an AMAZING experience and in just under a year my daughter caught up!"